Power-X cymbals manage to bring a more complex and musical sound to an area where these qualities aren't usually found in abundance. Considering how much in the way of bronze and man hours have gone into making them, they're great value too. Easily at home in high-volume situations. Good value for handmade products. Though part of the Istanbul Agop family, Alchemy cymbals are deliberately marketed under their own banner. This is because the Istanbul Agop brand is, for many drummers, synonymous with jazz. 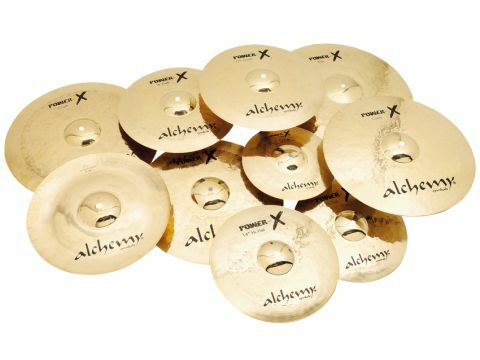 The name Alchemy was coined to promote Istanbul's more contemporary cymbal designs and over the past decade Alchemy has built up its own identity with five ranges of cymbals. Power-X cymbals have definitely been designed to operate in rocky territory. Like all Alchemy cymbals they are individually cast from B20 bronze then hand-hammered and lathed. In common with other Alchemy models they sport a brilliant finish. Each cymbal features a mixture of surfaces, beginning with a large unlathed area which stretches from the centre hole across the bell and onto the bow. This blends into a section of wide lathing bands which cover roughly another quarter of the radius, which in turn leads to a final tightly-lathed portion that continues all the way to the edge. The undersides are finely lathed all the way across to the unlathed bells. Evidence of aggressive hammering is found all over the bows of the cymbals and is especially visible on the unlathed area close to the bells. The bells themselves are untouched by hammers and their smooth curves are free to shine in an almost gloss-like manner. Five diameters of Power-X crash are available and an example of each was amongst the batch sent for review. The smallest of them - 16" - was the first to submit to a stick and it teemed with high frequencies, bursting into life at the moment of contact before quickly subsiding into a warm decay. Trashiness was present in the note which added a shimmering quality. "While being bright and in-yer-face enough to cut through, they still display a character that only comes from hand-made instruments." With the 17" crash, again the top end leapt out the instant it was struck. The note was a little deeper and, though complexity was present in the form of trashy overtones, everything resolved in a smooth decay. The 18" crash was overtly trashy in comparison and exploded with shattering attack followed by a more convoluted, almost china-like decay. Normality returned in the form of the 19" and 20" crashes, both of which delivered penetratingly bright opening bursts that subsided into a rumbling, dark note. Trashiness was still part of the recipe but it lingered more in the decay. Both of these larger crashes were fabulously loud and sliced through pretty much anything that had the nerve to be being played in their vicinity. With the crashes still ringing in our ears we turned to the supplied 12" splash and 16" china. The splash was all silvery sweetness and projected cleanly. The china, meanwhile, was extraordinarily aggressive, giving vent to a vicious bark that made us blink in disbelief. It was as loud as our own 19" china and its raw tonality meant that it punched more forcefully. The 22" ride has a fairly flat profile and its wide bell echoes this by rising in a gentle, low arc. Playing it resulted in a sharp, metallic ping that transmitted intensely even when tapped quietly. It's a seriously heavy cymbal and the sheer amount of metal present meant that there wasn't a great deal of wash build-up. Moving onto the shallow bell changed the tone to a deeper ringing but the volume level barely changed. To get it into clanging mode, the shoulder of the stick had to be engaged. The hi-hats were of a similarly stocky build to the ride and our unsophisticated hi-hat stand creaked when trying to lift the top cymbal. Unsurprisingly, the hats were supremely bright, delivering a cutting tone at a volume somewhere in excess of 11. On its own, the 'chick' from stepping the hats was strong enough to encourage faint resonance from other elements of our kit. The hats were both responsive and articulate with a warm, musical note beneath the searing projection.